Seamless Simplicity Run Windows programs like they were native to your Mac. 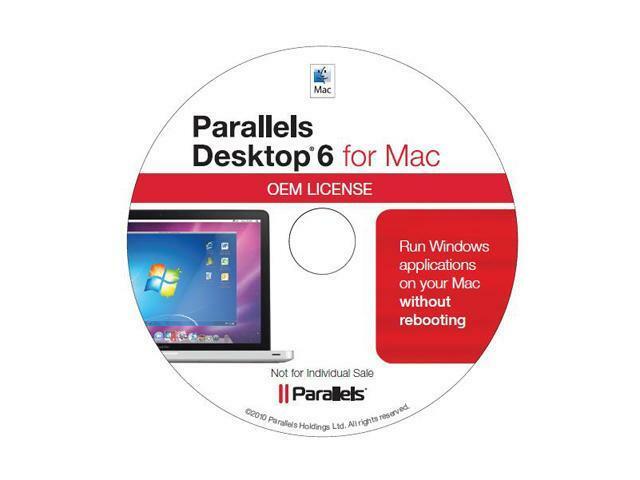 Setting up Parallels Desktop for Mac is simple and quick. Enjoy the best of both worlds - Windows and Mac OS X - on one seamless desktop. This OEM System Builder Channel software requires the assembler to provide end user support from the manufacture software and cannot be transferred to another computer once it is installed. To acquire manufacture software with support provided by manufacture please see our full package "Retail" product offerings. Comments: I got this for free with windows 7, I don't understand why the name has "system builders" in it, because you cant build your own actual apple computer. Pros: As most others i got this free....newegg didnt even want it and cant say as i blame them - haha...on the other hand last thing they gave me for free i sold on some auction site for 20 bucks so i wont complain. Cons: was made by apple so it can burn in ....that place with fire. I give it 1 egg becuase it was made by satin and his menions. It cuased me to waste my time writing this review but this is what makes Newegg rock. Other Thoughts: I had 1 ipod, never again will i subject myself to another apple product. I dont want to jump through all their hoops to install itunes then convert my entire library over to their format, from mp3 so i can then spend hours uploading after it finally converts. Nor will i buy any media from itunes. Their drm is crazy...you buy it they own it. No thanks i will rip the cd or buy from that other place i cant mention or newegg will smite my review - anyway they have drm free music. I will never understand why anyone would buy into apples hipe. My android phone was far better than my 400 $ ipod and takes seconds to put music on with no software needed. And since i carry it with me and its basically free, i mean i need a phone so its not an extra device i dont need. Go ahead you Mac heads feed the machine! Not me.....but please check out my parallels software on sell on some auction site :-) ... Rock on Newegg! Cons: did not need it nor did i want it but there was no way to get rid of it in the shopping cart. if i had a mac pc, why would i have ordered windows 7? Comments: Use this to install windows 7 and it was a breeze. Do not be fooled by the OEM version, no difference at all. TOok about 20 minutes to load windows on my Mac...loved it.